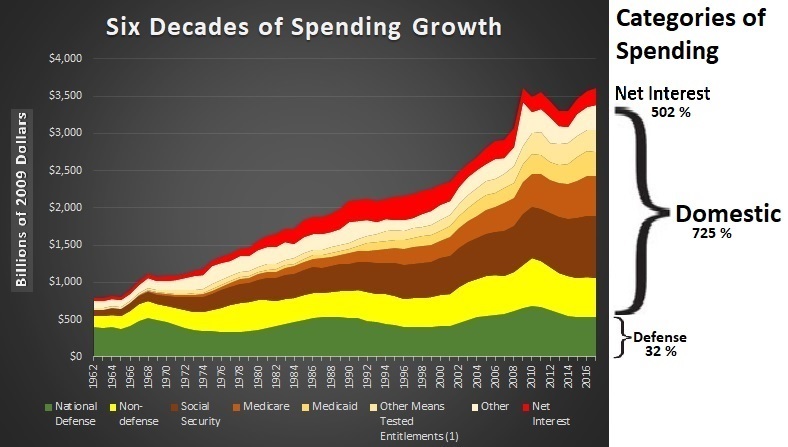 on March 12, 2018 at 10:59 am Entitlements: The "Most Predictable Economic Crisis In History"
The UBI is a federal program, replacing federal welfare support. States and charities would focus on those in need. Local support for local problems. In Massachusetts, a single woman with 2 children receives +$50,000 in welfare benefits, when federal, state, and charitable sources are combined. If federal support in cash is $18,000, the national Federal Poverty Level, Massachusetts and charities can make up the difference or add more if they wish to from their own funding sources. No children will starve. Your argument might be true in a true democracy, but we are a republic. Those in Congress and their financial supporters are all in the top 5%. They will make the argument that generous benefits should come from the state not the federal UBI program. Are you really going to withhold food from starving children whose parents spent their UBI on parties, trips, cars, houses etc.? The most likely outcome is UBI as a new redistribution plus welfare on top. Even in the fantastical scenario where UBI manages to temporarily replace all welfare, as soon as some UBIs are misspent, and children start starving, welfare will return. Then good luck putting the UBI toothpaste back into the tube. UBI itself will also spin out of control. Once everyone gets a direct dollar for dollar benefit through UBI then a supermajority will keep voting for UBI increases until there’s a US sovereign debt crisis — probably faster than on our current trajectory. Even if UBI limits were built into a constitutional amendment, soon there would be public outcry about The People not being able to vote their democratic will. The constitution only provides moderate inertia and resistance against a persistent majority. Just look at how the constitution is pushed aside on America’s trajectory towards socialized medicine. Good points. The biggest change will be attitudinal. The shift from dependent to responsible individual will be an eye-opener. This will end the “nanny” state. I don’t think loss of current welfare will be a problem as long as the cash allows them to purchase those same requirements but they get to allocate the cash. Because everyone receives the same amount, they are no longer “on the dole”. There will be no possibility of losing benefits by taking a job. For the very wealthy, UBI cash will not make up for current deductions, but the flat tax should be at a lower marginal rate and the economy should boom, befitting them the most. For those in the middle, examples are the best. A family of 4 would get a UBI of $24,000 [the Federal Poverty Level]. Would they rather have that or a tax deduction of $20,000 for home mortgage payments and a deduction of $12,000 [through their employer] for healthcare? I envision federal welfare being eliminated, along with dollar-for-dollar reductions in ACA, unemployment, disability, Social Security, Medicaid, and Medicare. States and charities will be free to define who needs extra support over the UBI base. These legacy programs will continue, but they will no longer be reduced by means-testing. The only tax will be a flat tax. There are those that would layer a UBI on top of everything else, with no changes to safety-net programs or the tax code. That’s certainly a non-starter. You may well be right about the technical aspects of a UBI plan. I have not thought through all the details or ramifications, but I could see it being technically workable. My concern is the human side. How easily will people give up all the existing government programs that a UBI is supposed to replace? Same for the changes in tax deductions? Same for the many, many people employed by or emotionally invested in the government anti-poverty infrastructure? Or will UBI be added on top of some existing ‘infrastructure’ that stubbornly remains? How likely is a flat tax and UBI going to be accepted by those obsessed with inequality? It’s the political or human side that gives me doubts about UBI. I do believe a UBI is constitutional, under a broad interpretation of the XVI Amendment. Married to a flat tax, the UBI adds a progressive feature. No citizen would live in financial poverty. The effective tax rate for every citizen would be based solely on the amount of income earned. Everyone would be taxed at the flat rate, with no “benefit cliffs”. Everyone would receive a UBI (based on family composition) and pay the same flat rate on income earned. Instead of subsidies to corporations, the UBI would instead subsidize individuals. The free market could then operate without centrally planned tinkering. While the free market requires that uncompetitive businesses fail, to be replaced by something new, it is not in the public interest to have individuals fail. They cannot be reconstituted the way the assets of a failed company can be reallocated. Charities have been so displaced by government, they could not handle the entire burden. With the federal government creating baseline support for all, charities can focus on those with special needs. The UBI would act only as a partial substitute for current safety-net programs [$0.9T of $2.0T]. Legacy programs would continue to provide support, so current social spending would not decrease. 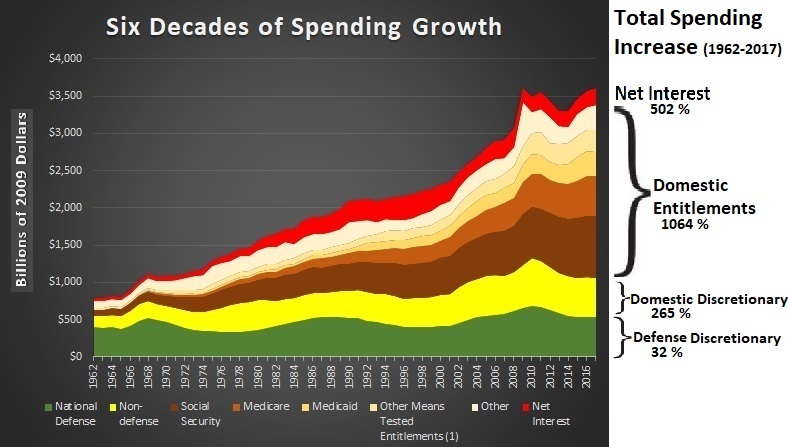 However, going forward social spending would decrease in cost relative to economic growth. 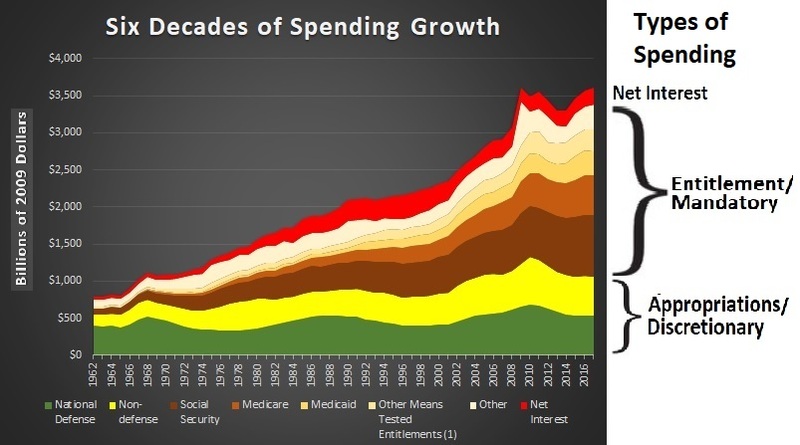 Yes, you would assume that this is a general issue of welfare legislation – expansion is almost natural, while reducing social spending would come with major political backlash. Do you beleive that the US would function better as a society if it reduced its welfare state? How do you make sense of European economies that often feature significantly more extensive welfare states, yet are at least funtional? 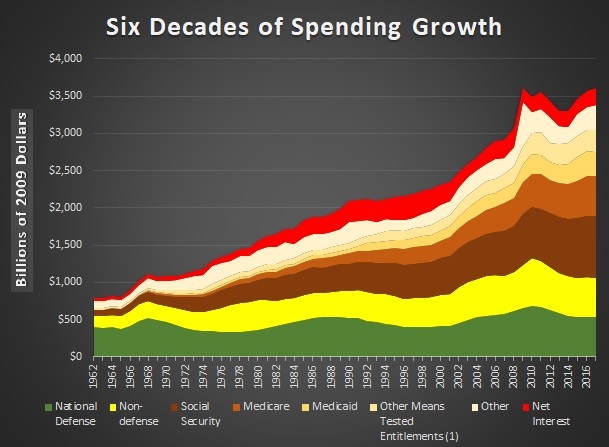 Obviously, we are not going to eliminate Entitlements. That being the case, redistribution of some sort has been universally accepted as a given. How to limit growth is the real challenge. The alternative is to replace it with something far more efficient that eliminates “welfare benefit cliffs”. A UBI for citizens creates its own cap, since population growth is currently 0.9%. Once set at the poverty line, the UBI should be adjusted for inflation. With “real” GDP growth running at +2% we will grow our way out of deficits. There is a fear that legislators will open Pandora’s box and increase the UBI beyond inflationary adjustments. However, it will be difficult to make significant increases without blowing the budget sky-high. A poverty level UBI can be funded through a dollar-for-dollar reduction in current programs [$0.9T out of $2.0T]. And elimination of all tax deductions [$1.4T]. If combined with a flat tax, the UBI makes the effective tax rate progressive, in a smooth upward curve. For those earning income, the UBI replaces current tax deductions, but that replacement is capped for the very wealthy. The UBI will be a federal program focused on poverty, whereas states and charities can focus on individual needs. This will allow states to try a variety of approaches. Blue states can fund generous programs, while red states might elect to have charities transition into a dominant role, thereby minimizing state taxes. To my knowledge, few US entitlement program are EVER reduced. Maybe the 1990s welfare reform. Maybe minor tinkering, like the 1980s increase in the age of eligibility for Social Security. Nothing major or long-lasting. 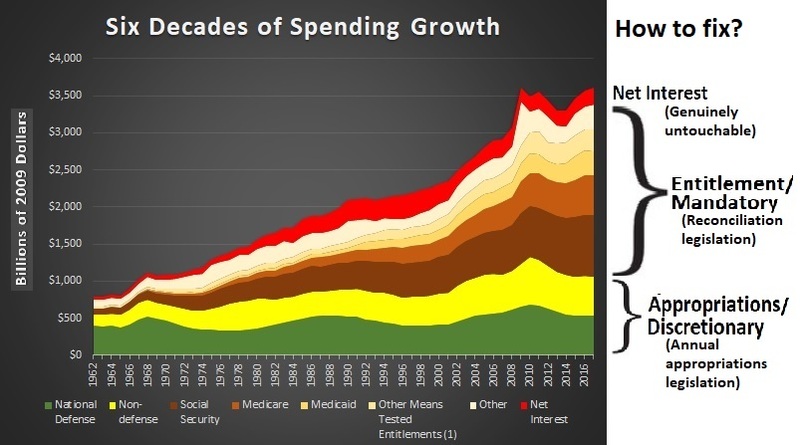 On the other hand, we have MANY examples of entitlement programs that expanded over time, with higher tax rates, higher benefits, and expanded pools of beneficiaries. In fact, that has been reality for most government programs. Are there any historical examples of major reductions in paid entitlements? I would imagine that reducing public spending on welfare is incredibly difficult politically.